Point of Care Testing Market size was valued over USD 21.0 billion in 2017 and is expected to witness 7.2% CAGR from 2018 to 2024. Increase in number of people suffering from infectious diseases and chronic conditions in developing nations such as China and India will boost the demand and adoption rate of point of care molecular diagnostic services. According to the statistics published by a UK-based organization, Avert, there were around 88,000 new incidence and nearly 69,000 deaths due to HIV infection in India in the year 2017. Hence, growing prevalence and awareness of infectious diseases will stimulate the growth of point of care testing devices market in the future. Recent technological advancements in point of care testing devices will spur the industry growth in the forthcoming years. Use of several different combinations such as bio-sensing platforms with smartphone-integrated electronic readers will provide precise on-site and on-time diagnostics. With healthcare systems focusing more on population health, precision medicine and management of chronic disease, impact of point of care testing continues to grow, and several prominent point of care diagnostic trends have emerged in the last decade, augmenting the market growth. High cost of the point of care testing devices will be one of the major factors responsible for impeding market growth in the upcoming years. The cost of individual point of care tests are mostly higher than the tests performed on large platforms. Hence, high cost of the testing devices will result in decline in device adoption, thereby restraining the market growth. Glucose monitoring devices market held the majority of market share in the year 2017 and was valued around USD 5,308.2 million. Growing prevalence of diabetes in developed as well as developing nations will be the major driving factor for segmental growth. According to the International Diabetes Federation (IDF) and Diabetes Atlas, more than 415 million people, aged between 20-79 years, had diabetes in 2015 and this number is estimated to reach to 642 million by 2040. Change in lifestyle, dietary habits, increased smoking and alcohol consumption and other environmental factors are likely to upsurge this number, fueling the business growth in the forthcoming years. 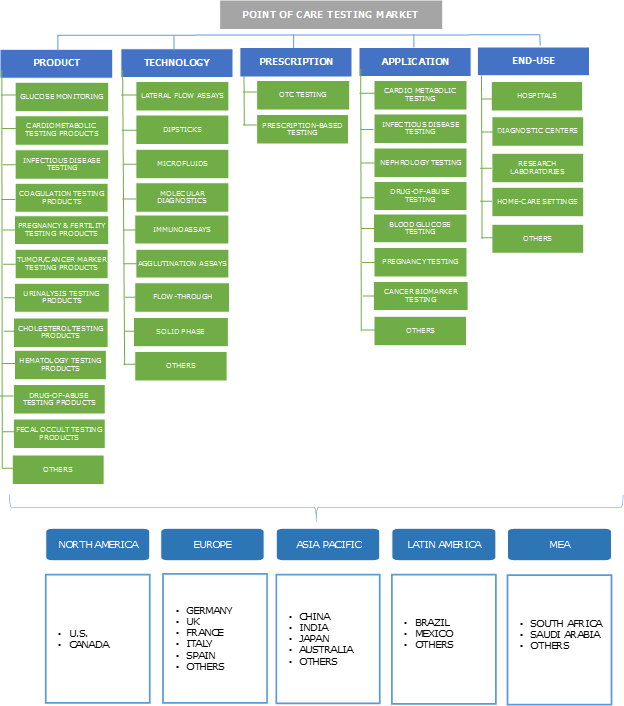 Tumor/cancer marker testing products market is estimated to grow at 7.6% in the foreseeable future. Increase in prevalence of cancer across the globe will spur the demand and adoption rate of cancer or tumor marker testing products, boosting the business growth. According to the statistics published the by American Cancer Society, there were estimated 1.7 million new cancer cases diagnosed and 600,000 cancer deaths in the Unites States in 2018. Hence, growing number of people suffering from cancer will drive the growth of cancer marker testing products market in the forthcoming years. Biosensors technology market was valued around USD 6,404.2 million in the year 2017 and is estimated to grow considerable rate over the forecast period. Rapid technological advancements, increasing acceptance of point of care diagnostics, increased applications of biosensors in the field of medical science and rising diabetic population base will drive the segmental growth during the forecast period. Role of biosensors in drug discovery and drug development has influenced the market growth positively. Microfluidics technology market is projected to grow at a robust CAGR of 9.3% over the forecast period. The integration of advanced biosensor technologies and microfluidics is projected to result in improved point of care diagnostics over the coming years. Microfluidics-based point of care devices have the potential to provide enhanced patient care such as early detection and easy monitoring of diseases, and escalated personalization. Microfluidics-based point of care devices are largely used for studying cell growth and analysis in molecular biology reactions. Hence, growing applications of microfluidics technology will spur the business growth. OTC testing market held market share of over 55% and was valued at USD 12,403.4 million in the year 2017. Robust growth of home healthcare sector coupled with growing demand and adoption of self-tests especially in case of blood glucose monitoring will drive the segment growth over the forecast period. OTC tests are cost-effective as well as easy operative in nature, leading to high growth rate. Prescription-based testing market is estimated to grow lucratively at 7.5% during the projection period. Point of care testing in primary care enhances rational antibiotic prescribing, thereby stimulating its demand. Nearly 50% of antibiotic use in human medication is either inappropriate or unnecessary across all medical settings. To reduce this, there has been increased usage of prescription-based testing, hence propelling the market growth. The application of point of care testing devices in blood glucose testing held the majority of market share and was valued at around USD 8,909.7 million in the year 2017. Diabetes prevalence is increasing in all parts of the world and most noticeably in upper and lower middle-income countries. The global prevalence of diabetes has increased two-fold since 1980. As per the WHO, around 422 million people were living with diabetes as of 2014 across the globe and half of them are still undiagnosed. Hence, increase in number of people suffering from diabetes will result in growing use and application of blood glucose testing products. The application of point of care devices in infectious disease testing is projected to grow at 7.4% over the forecast timeframe. Growing incidence of infectious diseases globally will act as the primary driver for segmental growth. As per the CDC 2016 data, around 16.8 million people in the U.S. visit physician offices for parasitic and infectious diseases. Development of molecular diagnostics has enabled ease of use, speed and low cost for point of care applications. Hence, recent technological advancements and growing prevalence of infectious diseases will be responsible for the growth of point of care devices in the forthcoming future. Use of point of care testing devices in hospitals was high in the year 2017 and amounted up to USD 7,543.4 million. Geriatric population suffering from chronic conditions such as cancer, HIV infection and diabetes require continuous monitoring and prefer minimally invasive procedures carried out in hospitals and clinics. Hospitals have high adoption rates for technologically advanced biopsy, mammography and other devices that are utilized in the treatment of cancer, therefore positively impacting the segmental growth. Use of point of care testing devices in diagnostic centers is estimated to grow at a CAGR of 7.2% during the projection period. According to the Journal Clinical Diagnostic Laboratories, around 7 billion diagnostic tests are performed every year in the Unites States. Growing diagnostic tests have been a major factor driving the business growth. Moreover, increasing cases of chronic conditions such as obesity, cardiovascular diseases and cancer globally will upsurge the demand for diagnostic laboratories. U.S. dominated the North America point of care testing market in the year 2017 and was valued around USD 8,738.3 million. Increasing prevalence of infectious diseases and growing application of POC tests for safe and early diagnosis will reinforces the regional dominance. Existence of a technologically advanced medical framework and recent technological advancements across the country will drive the point of care testing devices business growth in the country. India point of care testing market is estimated to witness significant growth at a CAGR of 9.2% during the projection period. 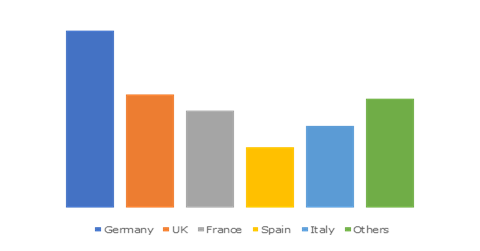 Growing per capita healthcare expenditure and rise in demand for rapid and cost effective in-vitro diagnostic devices will fuel point of care testing devices market growth. Also, growing awareness about early disease diagnosis and prevention will drive market growth in the region. 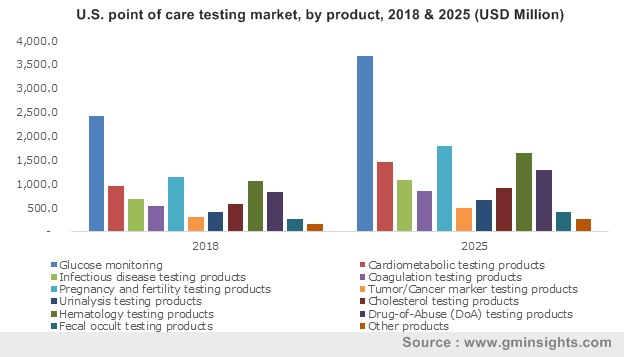 Some of the notable point of care testing market participants include Abbott, F. Hoffmann-La Roche Ltd., Johnson and Johnson, Siemens AG, and Abaxis, among others. These key industry players have undertaken certain strategic decisions that have helped them to sustain tough competition in the market. Companies focus on adding improvisations in the point of care testing industry that enhance the performance and hence will increase the demand of such products. Increased demand will also lead to rendering profits for the global point of care testing product manufacturing companies. Before point of care testing and other technological advanced diagnostics processes, samples were usually tested by the physicians. Gradually diagnostics moved to large highly automated, centralized pathology laboratories. Now with the help of advanced technologies, miniaturization and microprocessors, it is possible to perform sophisticated sample analysis for a wide array of analytes in real time while consulting with a patient. Recently, there have been tremendous advancements in point of care testing technology, resulting in continuous developments in several other technologies such as bioanalytical platforms, biosensors, microfluidic, assay formats, lab-on-a-chip technologies and other technologies. Point of care testing is a very significant technology in rapid detection of analytes near to the patient. There are several prospects of point of care testing devices that were developed in the last few years, paving way for the next generation point of care devices.